New York - June 5, 2007 -MDPublish displayed a selection of their most recent titles in the health and beauty category, penned by prominent aesthetic physicians from all over the country, at the annual New York City Book Expo. MDPublish authors held autographing sessions to enlighten the crowd about their latest books. Participants included Dr Stephen T. Greenberg, author of A Little Nip, A Little Tuck, an insider's guide to cosmetic enhancement which covers age-defying procedures from head to toe ; Dr. Elliot Jacobs, author of Mantalk, the definitive guide for men's health and fitness that includes tips from celebrity dentist Marc Lowenberg, DDS and dermatologist Howard Murad; and Dr. Allen Rosen, who also talked about his acclaimed cosmetic enhancement guide, Beauty In Balance, that provides a common sense approach to cosmetic surgery and treatments. Mantalk, by Dr. Elliot Jacobs, was nominated for Best Consumer Health Book of 2006 by the prestigious Library Journal. Upcoming titles include cosmetic dentist Dr. Gerald Curatola's much anticipated book on integrative health and dentistry, Smile for Life™. Dr. G. Patrick Maxwell, internationally renowned plastic surgeon and inventor of breast implant technology will launch his new book, Beautiful Breasts, in the Fall of 2007. "MD PUBLISH.com occupies a unique niche in today's marketplace. 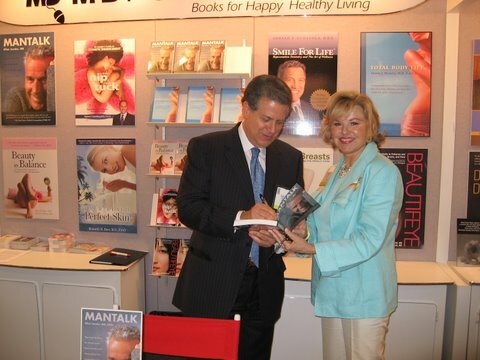 We are very proud to represent some of America's top doctors and leading experts as our authors," said MDPublish Publisher and Founder, Anne Akers. "Our books are aimed at the reader seeking information about the latest developments in cosmetic surgery, dermatology, cosmetic dentistry and age management. Our authors provide their readers invaluable information in a consumer friendly fashion, a winning combination for the savvy reader." ABOUT MDPUBLISH: MDPublish is a specialty publishing and marketing group that helps leading aesthetic physicians to become published authors, offering an array of services from book production, ghostwriting and editing, practice development materials, web development and optimization. COPYRIGHT 2009 MDPUBLISH. ALL RIGHTS RESERVED.